Camping is a great way to disengage from modern fast-paced, always-on lifestyles by basking in the great outdoors. I had no choice but to live “off the grid” one weekend last summer when the incompatible power at our campsite left us with no way to power up smartphones and tablets. Naturally, I had the foresight to bring at least one portable battery, but once that was depleted we had to make do with an occasional sip of DC power from our truck. Having learned this lesson the hard way I’ll come better prepared next time, with a portable solar charger that will keep the outdoor fun going for days. 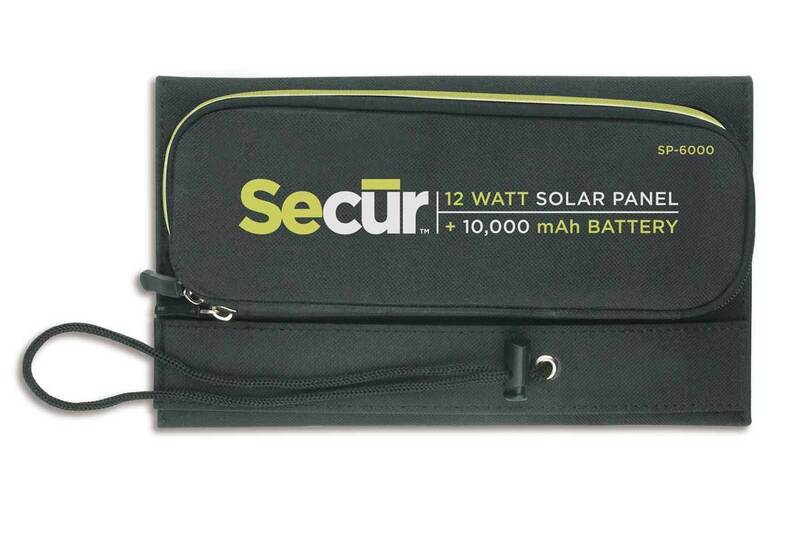 The Secur SP-6000 Ultimate Solar Charger ($125) packs dual six-watt solar panels and a rechargeable 10,000 mAh Lithium battery into a rugged premium case weighing 20.4 ounces. When closed, the 6.0 x 10.5-inch SP-6000 is small enough to fit into most backpacks, tote bags, or even larger purses. A zippered pouch on the outside opens to reveal dual USB-A ports with a combined output of 2.4 amps and four-position blue LED to keep tabs on remaining juice. 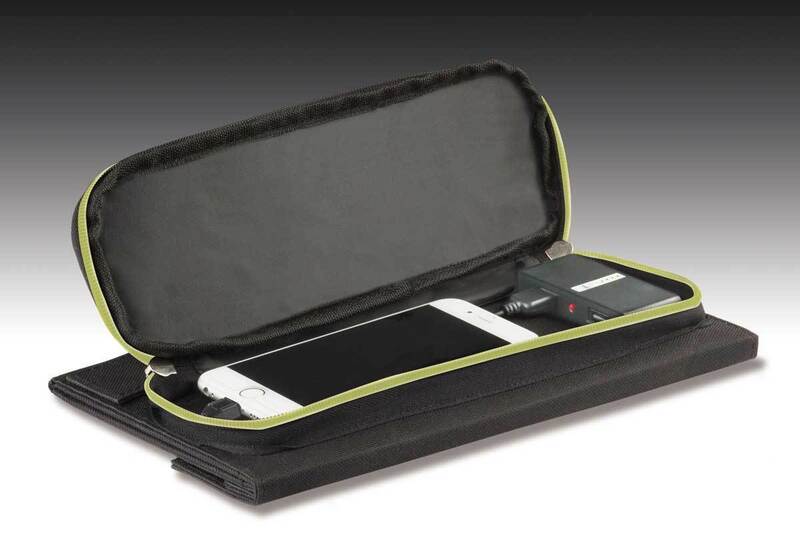 The pouch is barely wide enough to hold an iPhone 7 Plus or comparably-sized smartphone in a thin case; phablet-toting Otterbox lovers will be out of luck. With both zippers positioned at center, the pouch is waterproof, offering enough protection that you can charge while fishing, canoeing, or kayaking—provided you don’t capsize, that is. A waterproof pouch on the outside keeps your iPhone protected while charging from one of the two USB-A ports on the inside. The SP-6000 folds open to 16 inches wide, exposing the high-efficiency solar panels capable of a combined 12 watts of power. There’s an adjustable easel on the back for positioning the solar panels toward the sun. Direct sunlight is the fastest way for the panels to generate and store power—ambient light doesn’t cut it here. 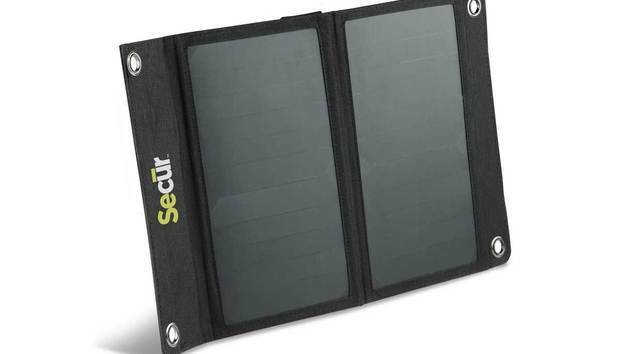 Secur’s SP-6000 Ultimate Solar Charger packs enough juice to top off an iPhone as many as five times on a single charge. Naturally, larger-capacity models like my iPhone 7 Plus come closer to three full charges, still quite respectable considering the convenience of solar energy. On a clear day with strong sunlight, the SP-6000 battery took around seven hours to fully charge; in my tests, an overcast sky added an extra couple of hours. Secur touts a built-in “smart chip” offering faster charging to compatible devices like iPhone, but from what I could tell, it’s only used while the solar panels are open and charging at the same time. Charging two devices at once didn’t seem to impact the speed at which both powered up, although Apple lovers need to provide their own cables, since Secur includes only a micro-USB cable in the box. There’s also no way to charge from external AC power, so if the juice runs out in the middle of the night, you’re out of luck until morning. Compact and lightweight enough for any backpack, the Secur SP-6000 Ultimate Solar Charger is a perfect companion for mobile device owners who love the great outdoors. Although a little on the pricy side, the Secur SP-6000 Ultimate Solar Charger will more than pay for itself on your next camping or fishing trip by providing power to spare for all your mobile devices.